Board wants to build Phase 1 of 2HS with Measure H. But it allocates only 100m to execute it. 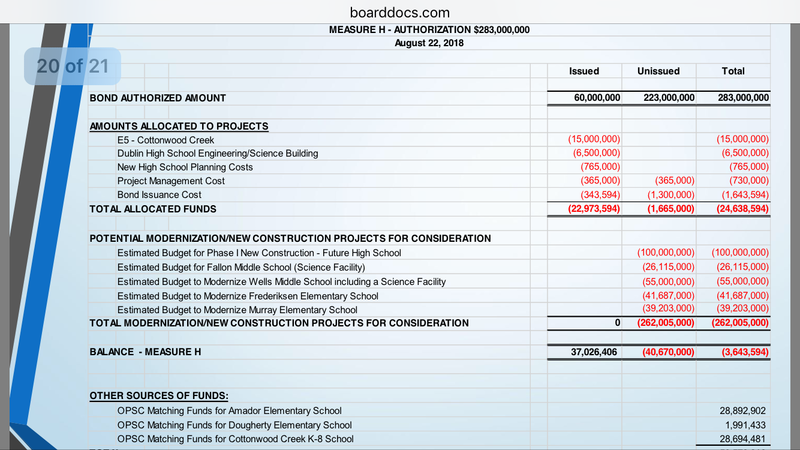 Currently, it has 37m balance from Series A of 60m took last year (15m went to the cotton wood creek K8 school – 2nd priority in Measure H and 6.5 to science building and remaining towards other expenses). Series B of 100m is coming this year sometime. 137M in hand, how much of it is going to be allocated for 2HS Phase 1 is the key. If the answer is none, then the remaining 123m – Series C of 90 is not due until 2022 and Series D 33 m until 2025 respectively. With this in picture with which series the 100M mentioned here is going to be allocated for phase 1 is going to be the key. Even if the board approves 123M instead of 100M for 2nd high school phase 1 on Aug 22, it is not going to deliver the 2nd high school in 2021 or 2023 or 2025 for that matter because the money is technically due only in 2022 and 2025. Can the board be series about delivering phase 1 by showing a timeline and budget allocation to deliver phase 1 ?. Clearly with what is being shown in the presentation there will be no 2nd HS in dublin in the horizon. Come.. show up in the rally and in the meeting and speak against this nonsense. Be there to show our kids you care. DUSD board commit to the Feb 2016 resolution for building 2HS phase 1 opening in 2021 with 1000-1500 capacity. Stick to the promise of building Phase 1 with Measure H as it was advertised during the Measure H campaign. Ask is 100m enough to deliver phase 1 of 2nd high school in 2021. Reach out to your local elected officials at School board, City Council, Congressman, Assemblywoman. How a parcel of land allocated for park in Jordan Ranch converted to more homes for school. A Flow of Numbers – How no one sees it ?